The point of burn decks in general is to get the opponent from 20 to 0 as quickly as possible. The strategy is usually restricted to mono red decks but Wizards of the Coast usually test the boundaries on how quickly you can burn someone down. With cards like Boros Charm and Bump in the Night, we have to splash a couple of colors to get the job done more quickly now. Seeing as how we have 2 sets of ‘duals’ for each color combination right now, it seemed like a good time to try it. The deck is 3 colors but technically Deathrite Shaman is also green and we sometimes want to make use of the green ability to gain some life in a damage race. Keep in mind that you probably want to keep the black mana producing lands unused in order to further burn your opponent at end of turn as opposed to keeping Stomping Grounds untapped (unless you really have to). Of course this is just the ideal. You can also just win on later turns. The deck does pack some Skullcracks to deal with the Thragtusk life gaining. The Deathrite Shamans almost double your burn value as well so if you get into the mid-game you can still hope to win. The rest of the deck is very similar to your basic burn/aggro deck. I went to a few local FNM’s and other tournaments with this build. It was fun winning a few games in 5 turns or so without ever having to interact with my opponent’s board except for casting a Skullcrack in response to a Thragtusk. This deck is a fine deck for any smoker, unfortunately I am not a nicotine addict. It did really well versus established decks but fell short against the randomest of random decks. At one point, I actually managed to -4 my Tibalt and hit my opponent for 6 damage! I don’t know if most of you are aware of how much of an achievement this this. It’s a creature dominated format after all, so keeping Tibalt alive is rather tough (activating his ultimate is rather impossible). Unfortunately, he ended at 1 life (Tibalt would have hot for 7 damage, had he not flashed a Restoration Angel in response). It was almost as if he knew that 1 point of damage mattered. Still, running a Tibalt somewhat successfully got the deck noticed. The overall win percentage was about 55%, which means I’ll be looking for something else to run at the World Magic Cup Qualifier. Another problem was that a lot of people were playing decks like Naya Blitz, Red Green Aggor, Hexproof Bant and Black White Zombies. In these kinds of matchups, it becomes a war of attrition. Basically, the last random dude standing that gets to attack is probably going to win. Considering that 8 of my main deck burn cards cannot target creatured, I’m not going to win that attrition war. You basically get to punish a lot, I mean a lot of midrange decks. They usually take a bit of shockland damage or are slow enough out of the gate for you to take advantage. Also, versus control, you can technically ‘overcommit’ on weenies if you are holding a Boros Charm for their Supreme Verdict. I think I was overall really disappointed with the ‘fourth’ color (aka. Green). Eventhough I never ended up facing any Reanimator strategies, I felt that splashing for that was really weak. It seemed really nice, cool and techy in the beginning. Cutting the Green altogether would change the manabase quite a bit. The Shaman would stay as he does a great impression of Grim Lavamancer in this deck. Oh, how this card is missed! A card that I was unsure about playing is Brimstone Volley. After testing, I would definitely try 2 in a more refined build. Casting a late game Vexing Devil hoping they take 4 so that you can pay 3 mana to hit them for what should be the final 5 points of damage is really ambitious. Blind Obedience was obviously hard to evaluate with only one copy in the whole deck. If I recall correctly, it was rather good when I got it in play. Each burn doing one extra is really nice and I would eventually fit in a second copy into the deck. If it does more than 3 life loss, it was already been better than Bump in the Night. Then again, at that point in the game, Bump in the Night would have done 6 (assuming you had mana to flash it back). The bonus of having your opponents would be blockers enter the battlefield tapped is nice when you’re attacking with little dudes trying to go through medium to big creatures. The Black/White ‘kicker’ to your burn spells is just gravy. Red being your main color, means you will probably have extra black or white mana to Extort your opponent. Also, it’s nice seeing an enchantment that doesn’t become useless when you put a second one in play. The Zombie of the Hour! How did he fare? Well, for one, against anything running small removal spells (Aristocrats, RG Aggro, etc) he was basically a lightning rod. He did a decent job against slower decks by helping out with aggro a bit. In the end, he just seemed to be lacking a little something. Perhaps in a future version with Lotleth Troll as a discard outlet? Who knows? The problem that you first notice is when you are ‘flooded’. I do not even mean realistically flooded, just for this deck. Flooded is anything over 4 mana, unless you are planning on flashing back a Bump in the Night for the final bits of damage. I think the Troll would fill this role nicely, since he provides great aggro and has trample so he doesn’t get token-chumped. The future of 4 color burn? The best upside to Scrivener was the ability to mulligan a bit more aggressively versus certain decks. Knowing you are facing a slower deck allows you to maybe even keep a reasonable 5 card opener with Blood Scrivener. I’m not saying it’s Insane! but it’s something worth considering. Instant speed Pillar of Flame is back! Still, there’s about 100 cards left to be spoiled. We can always hope. If anyone has other suggestions on improving, tweaking or taking the deck in a whole new direction (other than the trash), please reply in the blog or hit us up on our Facebook page . The value in this one is where it’s at. Clifftop Retreat, Slayers’ Stronghold, Thalia, Guardian of Thraben, Ash Zealot, Champion of the Parish, Spark Trooper, Silverblade Paladin all for about 25$. Not bad, Wizards. It’s about double that not counting uncommons. Wow! this is one charm I think everyone can get behind. All three modes are sooooo good in constructed! 1) 4 damage to target player? for two mana? Yes please. How insane is that? I think even regular mono-red decks will splash white via Sacred Foundry and Clifftop Retreat to go out of their way in order to play this burn. 2) Permanents you control are indestructible until end of turn? Take that Supreme Verdict! I think Terminus will have to be the solution now, hands down. Note: it will however not save your planeswalkers from dying to unblocked attackers. 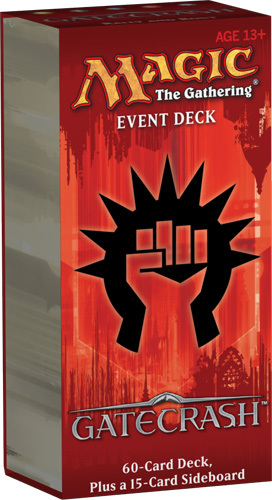 Bonus: Play it in commander with something like obliterate and watch your opponents cry! 3) Double strike? Double Cleave? Slap that on an unblocked creature and double your damage output. It can be pretty insane with any creature ability that triggers via combat damage or a creature that has something Ciphered on it as well. Which mode will you choose? All 3 modes make you want to run 4 maindeck in any Boros deck and quite possibly Naya decks. It keeps the aggro going at all times. In Commander, I would again consider this in my Gisela deck. I can tutor it up with Sunforger and effectively ‘Negate‘ a Wrath of God -style effect. I probably won’t be choosing the other two options much. Well, the 4 damage ability usually makes quick work of a few early planeswalkers. Burn spells are generally half as effective in Commander due to the fact that players start at 40 life. In this context, red decks are generally disadvantaged and also less popular. Aside from burn damage, Chaos Warp is probably on of the few red spells to deal with planeswalkers. Including this in your 100-card deck will give you some unexpected range. In those Magical Christmas land situations, you can always cast this targeting your Gisela and bring your opponent 1 damage short of losing to Commander damage. We can always dream right?